Oh, this was an easy one. Did we mention Maxwell loves water? Hopefully you don't have one of those touch on faucets. THAT would be entertaining! Puttin' da bitey on da water! I mean who wants to lap it up from da water dish, it much smarter to catch it right outta da faucet BEFORE Faraday and Allie slobber in it! *shakes head in awe* Yoo a genius Maxwell. Maxwell, you're getting that stuff all over you. You're WET! That's like a cat emergency around here! IT looks like you're having a grand time. Silly kitty! My kitty sis Sophie loves bath/shower water and sits in the tub waiting but she wouldn't do what you are doing! that is just too adorable. Wish Cody did that! What is with all these water cats? None of us go near the faucets or sinks. Well, my human found Boodie in the kitchen sink once, but it was bone dry at the time. He sure does! 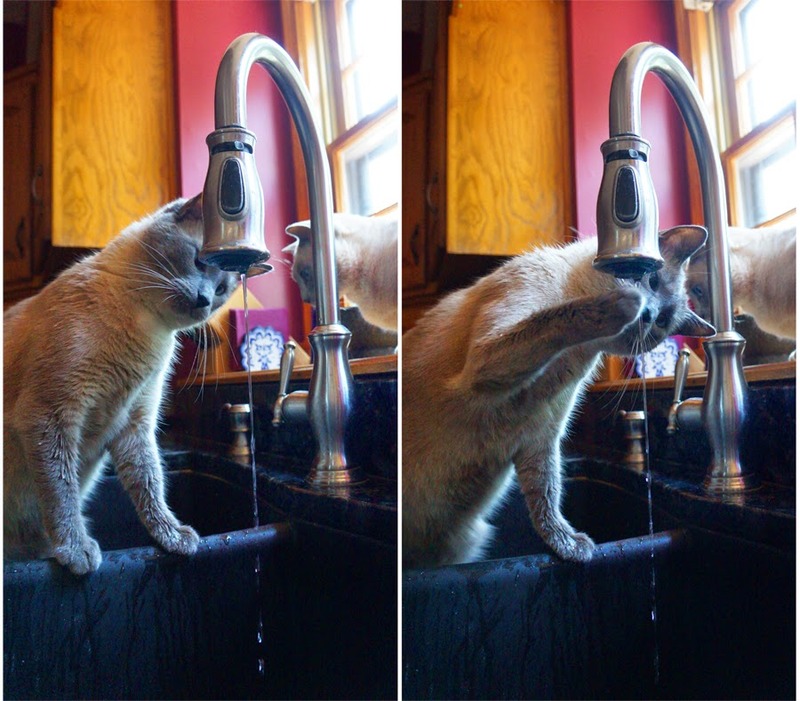 We never drink from the faucet. You look like you're showering!!! Maxwell you do love water! Maxwell you are a silly mancat! What brilliant photos - I love the first one!